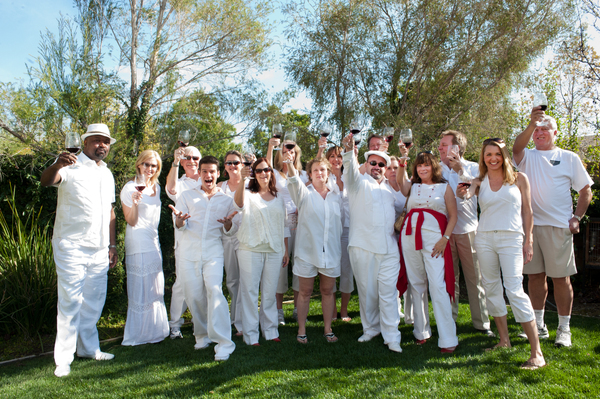 In the Mode of always looking for something different and fun, I present RED, WHITE, (and now) BLUES, WINE ADVENTURE! Okay, you for sure have heard of Red and White Wines but that is only half of this adventure. The Red of course will be RED WINE. The White on the other hand is NOT Wine but CLOTHING. Yes, you must come in all White clothing. (You may accessorize with Red, but it must be able to be removed for some of the photos) To make this even a little better and different, we will have at least two professional photographers with us. Why? You may be asking. 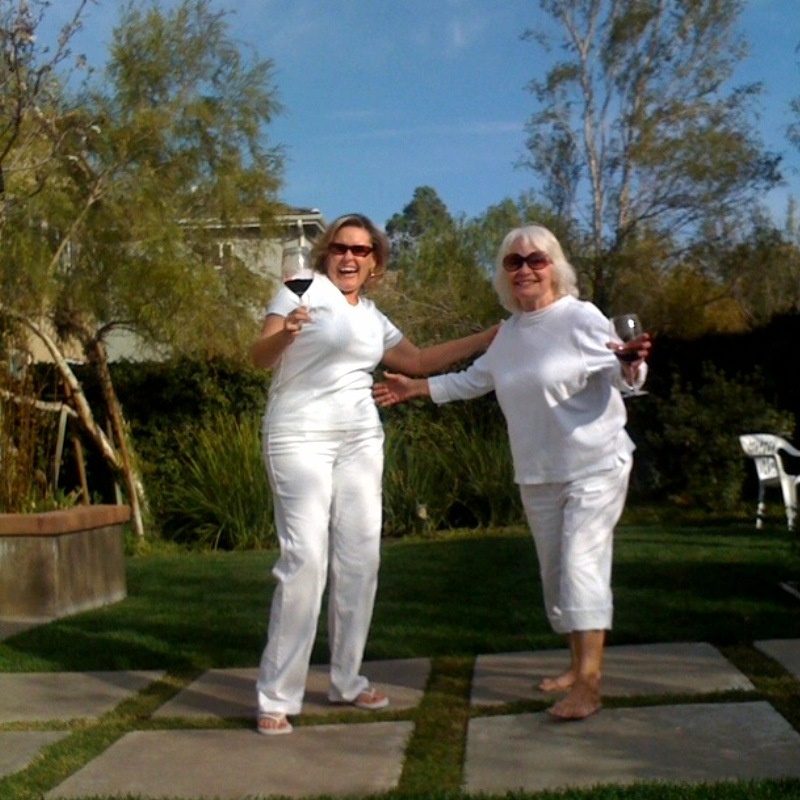 Because we are going to do a photo shoot in our White Clothes and Wine Glasses with Red Wine. Then, those of us Brave enough, are going to become Canvases for designs with the Red Wine. 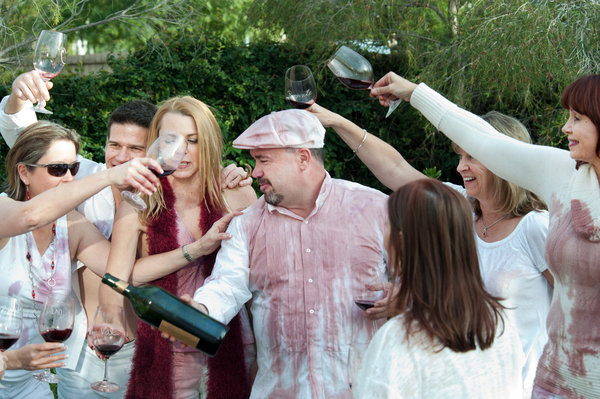 Yes, we are going to Spill, Splash, and place Red Wine on our White Clothes. We will be doing photos throughout. Who Knows how it will turnout, but it should be a blast! You must come in ALL WHITE and bring a bottle of Good Red Wine (Hello to Drink/Share) I will provide the Red Artistic Wine. You don’t have to take part in the Splash, but you should! You must have a great sense of adventure, and love to have fun! If this is not your idea of something fun to do with Wine please skip this event. I know this is NOT for everyone, but NO Negative Peeps allowed. We will have lots of other more common Wine events coming. You will probably want to bring a change of clothes. The change does not have to be White, but you must arrive in White or you will not be allowed in. NO EXCEPTIONS! It is not fair to those that take the time and effort to make this event Fun and Different. I decided to add some Blues to Saturday’s adventure, in the form of “The Blue Baron Band.” Anyone that came to the Greek Adventure will remember them, or at many places here in SCV. They are Great! Photo FOUR: Doug Gould having the time of his life! live music (thank you Doug!) and…………… small J Pollock drip paintings in progress, all shades of RED. I even got into it when the band took a wine break! Hi Vic, I was out when your comment came in, it’s all good, my spam just deletes messages with profanity or lots of misspelled words. It was great to see you and hear you perform!